Millikan High School Senior Camila Teagle-Alarcon joined College Board President David Coleman at a conference in Washington, D.C. this month to deliver a panel presentation on practicing online for the SAT with the Khan Academy. The conference, sponsored by the Foundation for Excellence in Education, was attended by about 900 educators and policymakers. Teagle-Alarcon, a member of the Millikan Advanced Placement Student Steering Committee's leadership team, also is a peer tutor who helps other students with homework and PSAT or SAT practice. Like many students at other Long Beach Unified School District high schools, she and other Millikan peer tutors report increases in their own SAT scores of up to 200 points thanks to their practice with the Khan Academy. College Board President Coleman noted that 2.5 million students are practicing for the SAT using the Khan Academy’s online tutorials. More than 2,100 students at Millikan linked their College Board accounts to the Khan Academy last year. Millikan offered a new PSAT practice course for sophomores using the Khan Academy at AP Summer Bridge in August 2016, part of a districtwide effort to provide students greater support on college entrance exams. In the panel discussion with Coleman, Teagle-Alarcon described the convenience of taking practice tests on her phone while waiting for her turn to compete in water polo tournaments. "It was kind of a stress reliever," she said. "When I finished taking a test, I knew I was just another step towards reaching my goal." 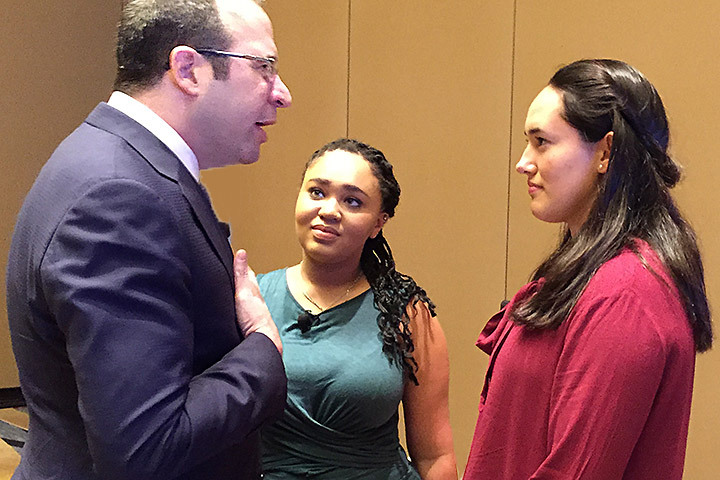 NATIONAL AUDIENCE – Millikan High School Senior Camila Teagle-Alarcon, right, prepares for a panel with College Board President David Coleman, left, and Florida student Avianna Johnson, center, at a Foundation for Excellence in Education conference attended by 900 people in Washington, D.C.